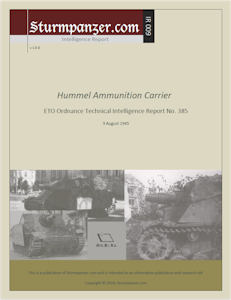 Intel Report on the Hummel Ammuntion Carrier, with 3 photos. "A German self-propelled gun chassis adapted for use as a cargo carrier… it is believed that it is the ammunition carrier mentioned in German documents as the "Munitions Träger Hummel" and "Gw. III/IV Mun".